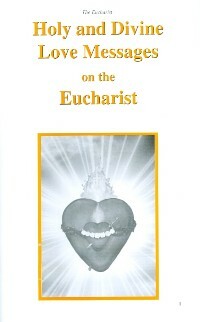 Booklet: "Holy and Divine Love Messages on the Eucharist". Booklet: Holy and Divine Love Messages on the Eucharist. The Real Presence of Jesus in the Eucharist is emphasized in messages given by Our Lord, Blessed Mother and St. John Vianney. Included is an appendix with detailed answers to questions about Holy Love, Divine Love, The United Hearts Revelation and The Chambers of the Sacred Heart of Jesus. Features a section on Eucharistic prayers. I invite you to fall in love with Jesus in the Eucharist. When you love someone, they are ever present in your hearts and in your thoughts. You try to please the one you love. My dear children, do not leave My Son unattended in the tabernacle. Send your angels to adore Him when you cannot go yourselves. These same angels will return to you bringing many graces. Front cover measures 5 x 7 in. Softcover. 40 pages.